Pinnacles National Park has spectacular boulder-strewn mountains and gorges filled with talus caves. The park is a playground for hikers and climbers. 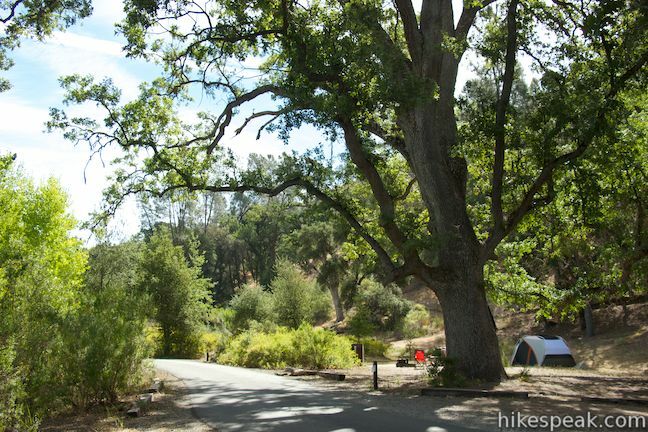 For campers, there is Pinnacles Campground, a 149-site campground set within an oak woodland on the east side of the park. While the campground isn’t in the middle of all the awesome rock formations, the park’s fun is close at hand. There’s only one developed campground within Pinnacles National Park, so if you want to stay overnight in this unique area, Pinnacles Campground is the place. Pinnacles National Park preserves 2,600 acres of unique terrain in San Benito County, California. The park is divided down the center by a chain of north-south running rock spires called the High Peaks. Access roads enter both the east and west sides of the park, but no road goes through the park. 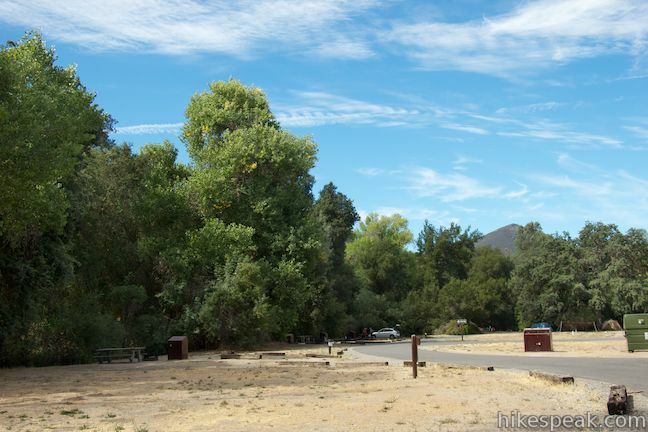 This is important to note because the campground is on the east side of the park and cannot be accessed from the west entrance (without a lot of hiking). 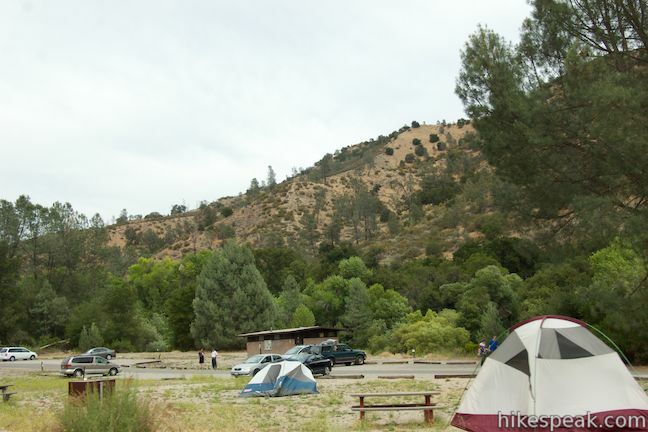 Pinnacles Campgrounds accommodates all comers, with tent sites, RV sites, and group sites. 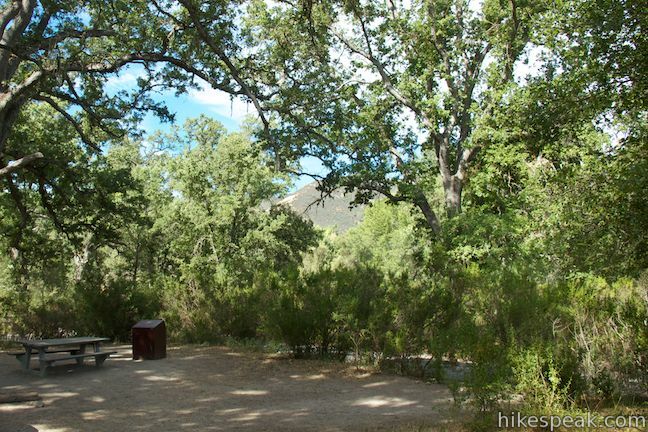 The tent sites and group sites have private picnic tables, food storage lockers, and fire rings, while the RV sites have access to shared picnic tables, fire rings, and barbecue pits. The RV sites have electrical hookups (the standard 120 volts with 30 amp breakers) and there is a dump station in the campground. Campfires are permitted (unless fire danger is too high). To see if campfires will be allowed during your visit, check the current conditions page at Pinnacles National Park. Wood gathering is prohibited, but you can purchase firewood from the camp host. Dogs are allowed in the campground on leashes. You can also walk dogs on paved roads, but dogs are not allowed on trails in Pinnacles National Park. Potable water spigots are dispersed throughout the campground along with bathrooms with flush toilets. There are showers in the campground next to the swimming pool. Oh yes, there’s a swimming pool and a general store that, like the campground, are operated by Royal Elk Park Management through a concession with the National Park Service. The swimming pool is open during the warmer months from April through September. The campground store is a convenient place to buy souvenirs, ice, snacks, and other things you may have left at home. To check store hours and ask questions about the pool and store, call the store at (831) 389-4538. While the standard tent and RV sites accommodate up to six people per site, the group sites can handle up to 20 people and five vehicles. If you have a party larger than 20 people, you can reserve adjacent group sites. 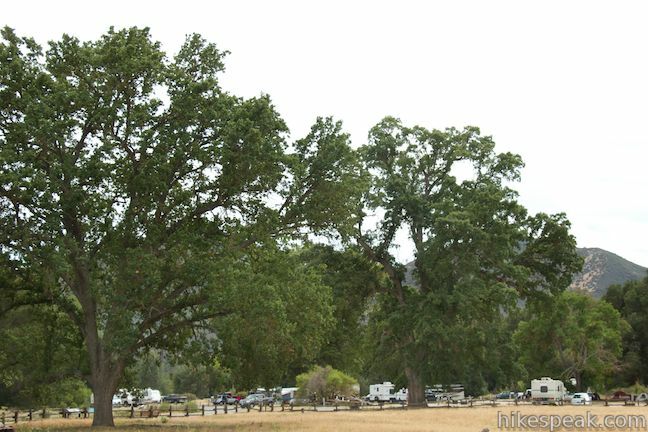 Large oak trees provide plentiful shade for much of the campground. Some campsites seem a little too close together, while others are more private. For tent camping, sites along loop C are furthest from the general store and said to be the most private. 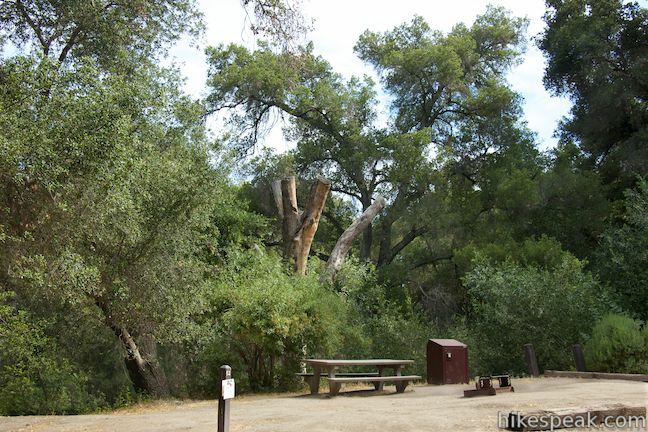 Campsites at Pinnacles Campground can be reserved in advance by calling (877) 444-6777 or online at recreation.gov. You shouldn’t need to make a reservation too far in advance, but note that standard powered and non-powered sites can be reserved up to 6 months in advance and group sites can be reserved up to one year in advance. 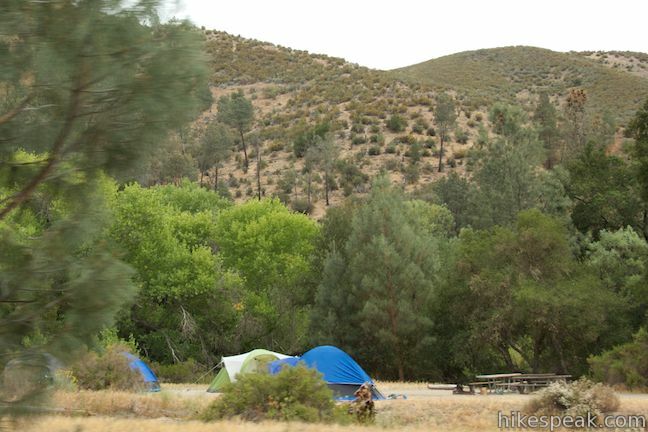 Pinnacles Campground has 99 non-powered tent sites, 36 powered RV sites, and 14 non-powered group sites. 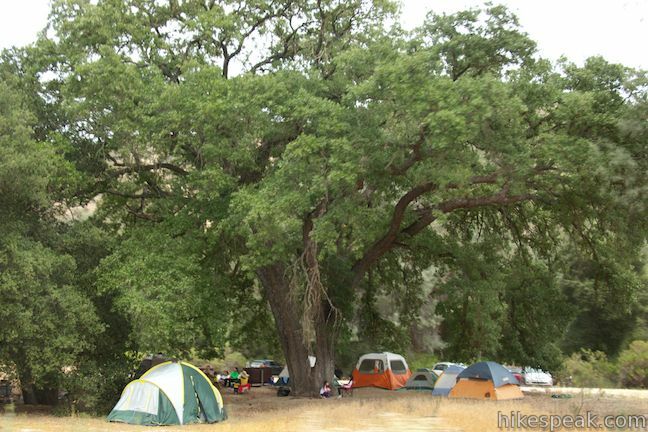 Tent sites can be booked for $23 per night and RV sites for $36 per night. Group sites are $75 for ten people or fewer and $110 if the group has 11 to 20 people. 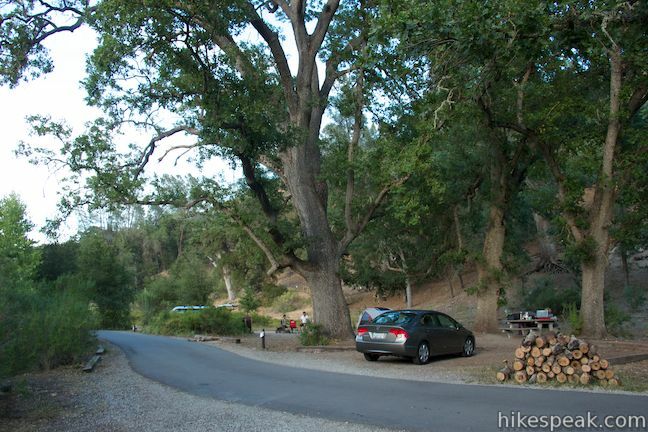 In addition to the campsite fees, Pinnacles National Park has a $15 per vehicle entry fee. National park passes like the annual America the Beautiful Pass are accepted in place of entry fees. Additionally, those with senior passes or access passes (for the permanently disabled) receive 50% off the price of campsites. Read more about park fees and passes at the fees page for Pinnacles National Park (all prices as of 2017). To get to the campground: Take Highway 101 north to King City and exit on First Street (exit 281). Turn right at the end of the ramp, heading north on First Street for 1.3 miles. The road makes a sharp right turn and becomes Lyons Street/Country Road G13. Take G13 out of the city, northeast for 14.3 to a T-junction with Route 25. Turn left and drive 14.2 miles to an intersection with Route 146. Turn left onto Route 146, following signs for Pinnacles National Park. Drive west into the park for just under two miles and turn left at the visitor center and general store to reach the campground (if you come to the East Entrance Station, you missed the turn). These photos were taken in June of 2014. Click to enlarge. This 1.5-mile hike passes through a talus cave to reach a reservoir on the east side of Pinnacles National Park. This 5.3 to 6-mile loop crosses the roof of Pinnacles National Park on an incredible trail. This extensive 9-mile loop ventures between the east and west sides of Pinnacles National Park, crossing through the High Peaks and Balconies Cave. This 2 to 2.4-mile hike venture down Balconies Trail past impressive rock formations and through a fun talus cave, starting from Chaparral Trailhead on the west side of Pinnacles National Park. I see in the campsite availability table a site classification of “W” presumably that is for “Walkup”. But what exactly is a “Walkup” Campsite? Can short trailers dry camp in the tent camp sites? The RV dump site is currently closed.